This walk: 2013-10-16. Venford Reservoir, Holne Moor sign, 2009 spillway, Dart valley, Sharp Tor, lichen, White Wood, bracket fungus, Bench Tor, Mel Tor, Yar Tor, Rowbrook House, Combestone Tor, strip fields, Richard Dawson - Lord of the Manor of Holne - boundary stone. Venford Reservoir under the skies of an threatening weather forecast - but it was clearing weather. This sign did not lend itself to detailed photography, it seemed to be rotting in the case. Probable original wrought iron gate and pipe-work, halfway across the dam, from 1907. Looking down into the valley of the Dart. Sharp Tor (right edge), SX 686 729, elevation 380 metres (1246 feet). Quick - while the sun is shining! One of five or more drainage channels across the path. Sign of unknown meaning, no doubt associated with a nearby water hydrant valve (look down their web page for this sign). Bracket fungus, photographed at fairly long range for my camera. At the top of the path going up to Bench Tor, going out into the sunlight. Sharp Tor (left) and Mel Tor (right), SX 693 726, elevation 346 metres (1135 feet). Yar Tor, at SX 678 740, elevation 416 metres (1364 feet) in the distance with Sharp Tor (right) and Rowbrook House in the foreground. Combestone Tor, SX 670 718, elevation 356 metres (1168 feet). One of the piles of Bench Tor. Click the image to see a larger version. The next approached pile of Bench Tor although it was not explored on this walk. Looking in a westerly direction at old field systems - there are both "square" and strip fields to be seen on closer inspection - ALSO see the purple locators on the Google map linked at the top of the page. Click the image to see a larger version. A view of the 2009 spillway in sunshine! There it is - the revamped buildings below the dam. Boundary stone marked RD / H, signifying Richard Dawson, Lord of the Manor of Holne. The reservoir catchment area of 700 acres is marked by these stones at 200 yard intervals. Source: Dave Brewer (2002), Dartmoor Boundary Markers, Halsgrove, page 288. Another view, with the dam in the background. 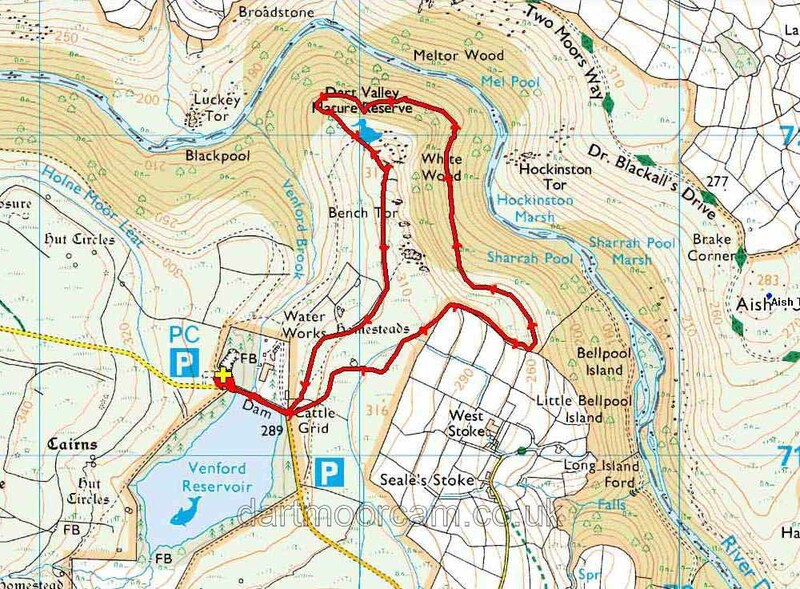 The approach was from the A38/Ashburton turn-off, passing the River Dart Country Park, crossing the Holne Bridge over the River Dart, through Holne and on to the Venford Reservoir, parking at the park over the dam. The roads to this car park are quite good with parking and toilets at the P symbol and yellow cross on the map.